Corporate members are companies, nonprofits, government agencies and start-ups that operate in the edtech marketplace and are seeking to build relationships with educators and education leaders and want to share their expertise. Corporate membership opens the door to communication and collaboration within the vibrant ISTE community. Engage with school leaders and decision-makers while gaining critical visibility and brand awareness. 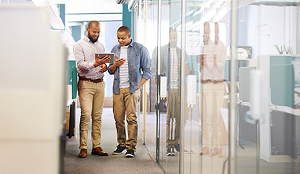 Explore the ISTE corporate member directory to find out who is part of the community of change agents who are empowering connected learning worldwide. Take advantage of your ISTE connections, elevate your brand and support our mission through sponsorship opportunities. Raise your profile among educators and network with thousands of leaders who are passionate about education technology. ISTE corporate membership is an affordable and effective way for your company to engage with the leaders and decision-makers in the edtech market while gaining critical visibility and enhancing brand awareness. Gain valuable intelligence about what’s happening in schools and classrooms. Play a vital role in advancing the ISTE vision and mission. Corporate Memberships can not be renewed online. Year-round mission sponsors enjoy a generous benefits package featuring top-level presence at the ISTE Conference & Expo, as well as additional unique opportunities for in-depth engagement with the ISTE community throughout the year. 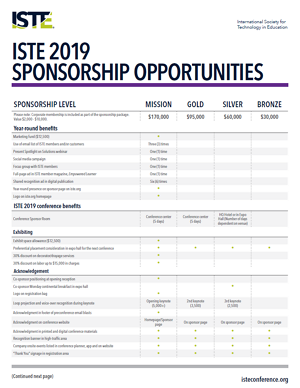 Our gold, silver and bronze sponsorships feature a wide range of opportunities for high-impact visibility and powerful connections with the edtech leaders and decision-makers who attend the ISTE Conference & Expo. Learn more about ISTE sponsorship. Submission of the application to become a corporate member and payment of the annual dues constitute agreement to these terms and conditions of membership. Membership dues are based on a company’s number of employees. ISTE does not verify the number of employees reported by the company. Membership term is one (1) year, beginning with and including the month the annual dues payment is received. Individual premium and online ISTE memberships are concurrent with the term of the corporate membership and expire with the corporate membership unless that membership is renewed. The corporate member must designate the individual(s) to receive the memberships. The individual memberships must be assigned to employees of the corporate member. Corporate members receive a special ISTE Corporate Member logo and usage guidelines at the time membership begins. The logo may be used only in conformance with the usage guidelines and only during the membership term. Member is not allowed to use any other ISTE logo or mark. Content for Spotlight on Solutions e-newsletter is solicited from ISTE Corporate Members to highlight their success stories, new initiatives etc. The newsletter is published at least two times per year. Submission must meet ISTE guidelines and is subject to ISTE review and approval. Space is limited, and submissions will be accepted and included on a first-come, first-served basis. Acceptance and inclusion of submitted material is not guaranteed during the membership year. Solutions demonstrations at the conference and meeting room reservations in the exhibitor lounge are scheduled a first-come, first-served basis. Availability is limited. Number of invitations to exclusive/high-profile events may change based on the number of events at the conference, size of events, format and other circumstances. Super early bird registration pricing extended to up to 10 company representatives at any point prior to the conference or onsite. This represents a 15% discount on conference registration.